Marines are known to be tough SOBs, so what do you think Space Marines are made out of? 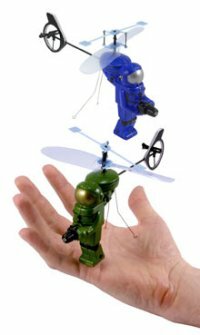 ThinkGeek as Dueling Space Marines Copter Set up for grabs, and at certain angles it looks as though they’re shooting laser pee at each other. This Dueling Space Marines Copter Set gets you a set of two mini r/c helicopters with infra-red laser tag style battle action. Take to the air from the palm of your hand then use the shoulder button on the remote unleash a plasma blast your opponent copter. Each shot causes the gun of your space marine to flash with simulated gunfire. The first hit causes your enemy to spin. The second makes the enemy copter lose power… the third cuts rotor power completely as your opponent plummets to the ground and you gloat in victory. However to truly dominate the sky, you’ll need to practice up on your flying skills. With stable flying characteristics and forgiving crash dynamics these diminutive space copters are perfect for hat impending battle against the betentacled alien planet hopper that awaits when you level up.